The film begins in disorienting, claustrophobic darkness, with the word “ONE” appearing on-screen. A couple, Lorna and Peter (Nicole Vicius and Christopher Denham), drive to a garage where, secured by plastic cuffs and in blindfolds, they are then transported to a clandestine site where they are searched, scrubbed down, dressed in robes, and, after a complex ritualistic handshake with a long haired, bearded, bespectacled hippie (Richard Wharton), led to a cult-like circle. 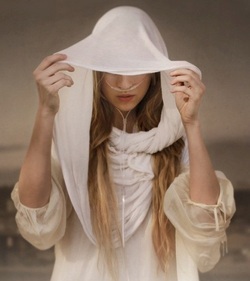 A female figure in a hooded, white robe enters and lifts back her covering revealing the face of Maggie, a stunning, young, blond woman (Brit Marling), who claims to have stumbled in from the future. She says she has an weakened immune system that will not allow her to be exposed to the world, and so she must remain cloistered in this basement area breathing oxygen and growing her own food. Maggie knows that great afflictions will befall the world in the coming decades: she is here to warn us that only the most rigorous training and soul-searching will prepare those among us who want to survive. “TWO” then appears on-screen. We discover that Lorna and Peter are undercover agents investigating whether this bizarre set-up is part of a cult. We are told by a mysteriously unseen narrator that both Lorna and Peter are also working toward their own recovery from problems, he from having been raised in a cult, she from the excesses of fame. Peter is determined to expose what he sees as a cult: “It’s clear, they’re suckers. She’s a con artist and dangerous.” He is armed with a camera lens in his glasses. For better reception, he has ingested the transmitter. As Sound of My Voice proceeds through its 10 segments, characters are introduced and circumstances evolve that play intriguingly with the ambiguities of the situation and the enigmatic psychology of the characters. It is a strategy that was employed wonderfully by the filmmakers in their last film, Another Earth, in which we thought we were watching a psychological drama, but it became a strange kind of science fiction film. The central character of Rhoda, also played by Brit Marling, was dealing with the severe psychological trauma that followed a hideous car accident, in which she caused the death of a man’s family. But as the story twists and turns, a parallel plot about the discovery of a duplicate earth emerges. Like Another Earth, Sound of My Voice tosses logic and expectation into a unpredictable conflict among genres: is this a psychological thriller, a science fiction film, or both? Both films were co-written by Brit Marling with her directors (Mike Cahill for Another Earth, Zal Batmanglij for Sound of My Voice). Marling’s intriguing formula worked beautifully in terms of story and character in Another Earth, particularly in its startling conclusion. The current film draws on our fascination with cult-like behaviors. In last year’s Martha Marcy May Marlene, first time director Sean Durkin gave us a hypnotic portrait of a cult refugee attempting to re-assimilate with her sister’s family. P. T. Anderson’s religious cult drama The Master is scheduled for theaters in October. What ultimately holds our attention is Marling as an actress. She is stunningly beautiful, her eyes urgent and disquieting. Her savvy ability to underplay draws us in even though her character’s motives are out of reach. Her calm presence and ethereal beauty, combined with her commitment as an actress to a role that is less than clearly defined, establishes Maggie’s credibility, which, appropriately, gives the audience the creeps. She has written a difficult part for herself, and she commits to proffering radical ambiguity with intelligence. I can understand an audience finding some situations in this film less than credible, but, as with a lot science fiction, suspension of disbelief is essential. Marling’s films are teasingly mysterious, from their disconcerting beginnings to their startling conclusions. The pace is patient, deliberate, and tense; the acting is strong and believable; the music is ambient and understated (by Rostam Batmanglij, who is in the band Vampire Weekend). I count myself among those who never see a surprise coming, but Sound of My Voice has more than twists and turns—it has a lot of charm and credible suspense. Have I yielded to the cult of Brit Marling? I was always a sucker for pretty face and a good yarn.